Instead of meeting in Los Angeles, as they usually do this time of year, the 800 state council delegates of the California Teachers Association, along with hundreds of others, mobilized over the weekend in their local districts, making phone calls and house calls urging voters to say yes on Proposition 30 and no on Proposition 32 by capitalizing on what they consider their best asset: themselves. CTA may be the most powerful force in Sacramento, but the double challenge of Props 30 and 32 clearly has teachers worried. The former, a $6 billion tax increase, would, if defeated, lead to more teacher layoffs, furlough days, and larger classes. The latter would ban public employee unions from collecting dues for political purposes but leave corporate interests and wealthy individual donors largely untouched. One initiative would strike at teachers’ wallets, the other at their influence. But at a pep rally with Gov. Jerry Brown in San Francisco over the weekend, teachers said there’s a lot more at stake in the upcoming election than their own interests. Anxiety and accusations rose late last week, with disclosure of an $11 million contribution from an Arizona-based nonprofit, Americans for Responsible Leadership, to the California Small Business Action Committee, which is campaigning against 30 and for 32. California Common Cause has asked the Fair Political Practices Commission to investigate, arguing that the group is in violation of state campaign finance regulations because it will not reveal the identities of the donors. Gov. Brown took up that charge when he spoke to the union members over the weekend, suggesting that there might be money laundering involved because such a huge sum of cash couldn’t have come from a group of small businesses. “In truth, they’re neither leaders nor are they small businesses. It’s major financial interests and powerful corporations or personalities that have the ability to move $11 million at will,” said Brown talking to reporters following his speech. “I believe the Small Business Action Committee knows who it is and they’re hiding that fact.” (Click here to read the full text of the Governor’s remarks). CTA has donated $21 million to the Yes on Prop 30 and No on Prop 32 campaigns, making it the single largest donor, while putting pressure on its political war chest. Full-time teachers contribute about 8 percent of their union dues – $52 out of $647 – into a fund, the Association for Better Citizenship, which is used to support candidates and initiatives, according to Dawson. With 300,000 members, that’s more than $16 million annually, which can be socked away for election years. Seven years ago, when faced with a package of education propositions by Gov. Schwarzenegger that the union opposed, CTA added an extra dues assessment of $60 for three years. This year, CTA didn’t go that route because many teachers already have experienced pay cuts through furloughs, and there are 30,000 fewer dues-paying members because of layoffs. Members are feeling stressed, said KC Walsh, a special education teacher from the Oak Grove School District in San Jose and a director on the CTA board. “This is a huge ask. Teachers are feeling demoralized with pay cuts and pressure on testing by the state and federal government. I challenge anyone to say we are not working hard. And now we’re asking them to do more” by getting involved in the Nov. 6 campaign. 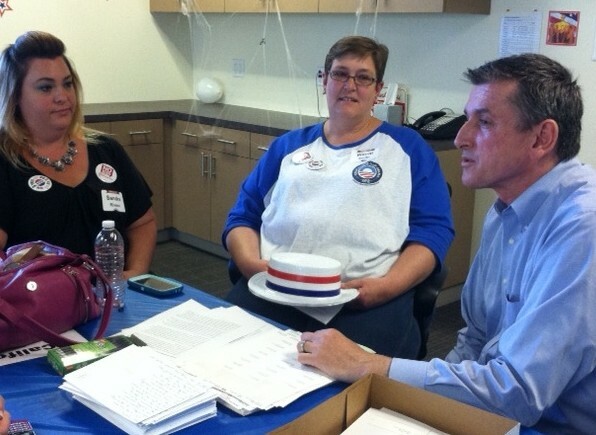 This year, CTA has expanded a strategy first tried in 2005, when they faced a similar initiative to Prop 32 on the ballot, and is paying some presidents of local unions and other activists to take a leave from their classrooms to work full-time on the campaign. In the San Jose area alone, there are seven released teachers working through the November election. 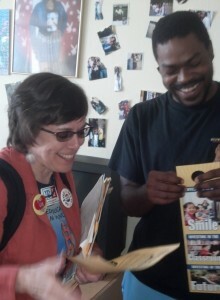 In San Francisco, union vice president Susan Solomon left Saturday’s pep rally freshly energized to spend the rest of the afternoon talking to voters in a diverse, working class neighborhood of small auto repair shops, apartments, and houses, all of them heavily protected by barred doors and windows. Down the block, Darrell Collier invited her inside, as his preschool-aged nephew ran outside with his scooter, followed by the boy’s father. Collier is young, a community college student hoping to transfer to UC San Francisco. He runs a basketball program at the local Boys and Girls Club and knows from his own recent experience and from the kids in his program what’s happening in California public schools. “I understand what schools need,” said Collier. “I’m from the East Coast, so I know what schools that have money can do for you and what schools that don’t have money do.” He was so enthusiastic about the initiative that Solomon took it to the next level and asked if he’d be willing to volunteer on the campaign. Collier said yes. Campaign finance activity – Reports of donors and contributions to state ballot initiatives on the California Secretary of Sate’s website. Fair Political Practices Commission – Press release regarding new regulation to improve transparency in campaign financing. 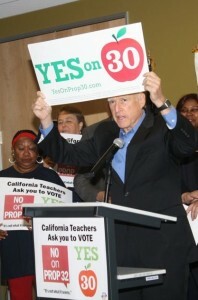 Proposition 30 – Impartial analysis from the California Legislative Analyst’s office. Proposition 32 – Impartial analysis from the California Legislative Analyst’s office. Proposition 38 – Impartial analysis from the California Legislative Analyst’s office. MapLight Voter’s Edge Project – A list of the major donors for and against Prop 30. MapLight Voter’s Edge Project – A list of the major donors for and against Prop 32. MapLight Voter’s Edge Project – A list of the major donors for and against Prop 38. The governor just said the other day that he would consider additional budget cuts EVEN IF his Prop 30 passes. Whaaaaaa? (http://www.kpbs.org/news/2012/oct/18/brown-wont-rule-out-future-budget-cuts-if-prop-30-/ ) Where does THAT leave our schools? Prop 38 is the only initiative that can honestly guarantee additional money for our schools because it is money that is over and above any Prop 98 minimum the governor comes up with for any given year. CA is 47th in the nation in per pupil spending. This is disgraceful and this needs to change! Yes on Prop 38! A yes vote for prop 30 ends cuts to the current public education funding. A yes vote for prop 38 brings in much needed additional funding for public education. A yes/yes vote for these propositions tells politicians that we intend to turn our failing public education system around and we are demanding logical, sufficient, and stable funding for public education. A yes/yes vote says that we are demanding real, systematic change in support of high quality K-12 Public Education. A yes/yes vote says that fundraising for everything from teachers to toilet paper in not the answer to fixing our Public Education in California. I like it when the CTA needs to win hearts and minds one voter at a time. That is how a true grass-root organization gets its deep support and I commend them for it. What I don’t like is when CTA expects no need to win its political donations from teachers one teacher at a time, and instead expects the government to automatically confiscate political dues from every teacher and pass them to CTA. Or when CTA has the Governor spread baseless innuendos of “money laundering” at those who believe that unions do indeed need to win the hearts and minds of their members — one at a time — before they can get their hands on employees’ political money. So I like prop 32. Uh Ze’ev Wurman…. I don’t think that your statement is accurate, you said CTA “expects the government to automatically confiscate political dues from every teacher and pass them to CTA” I may suggest you look at Prop 32 more closely. We are fighting to keep our automatic contributions intact (I pay 1 dollar per month to my local PAC). Do you realize that the super wealthy corporations that don’t need to collect contributions because they write checks from their war chest? What I am sure of is this: there is big money behind yes on 32. In my opinion it seems like folks are trying to dismantle the working class and take their voice out of the political arena. I am sure that you realize that this is not the first time that this type of proposition has been on the California ballot. We are just trying to protect our rights. I don’t like Proposition 32 and hope that maybe you may take a second look to try to understand why teachers, fire fighters, bus drivers and other union workers are fighting so hard to defeat Prop. 32. Wow. Didn’t think it could be done but there you have it. A puff piece on the CTA.